Last Thursday was packed with activity which included going running with Christopher McDougall, the guy who wrote Born to Run and then watching some of the Penn Relays with the West Philly Runners and then in the middle of the freaking night, going over to Curio Theatre to photograph the poster for their new production of Noises Off, a farce in which many people run around in their underwear. I got there at the end of a long rehearsal day when, I think, everybody was ready to go home (as was I) but the actors were all excited to see me and I felt a terrific invigoration. I'd worked with almost all of the cast before on various other projects and it felt more like coming home than going to work. The big problem with a shot like this is always getting the whole cast on stage at once in places where they've all got reasons to be, and doing it all in 20 minutes. I used a Leica M9 and a Voigtlander 28mm F2 lens and an off camera strobe through a 32 inch shoot through umbrella. If I'd had my druthers I would have used the 63 inch umbrella but I was carrying everything myself and it had been a long day. Noises Off! Clickenzee to Embiggen! 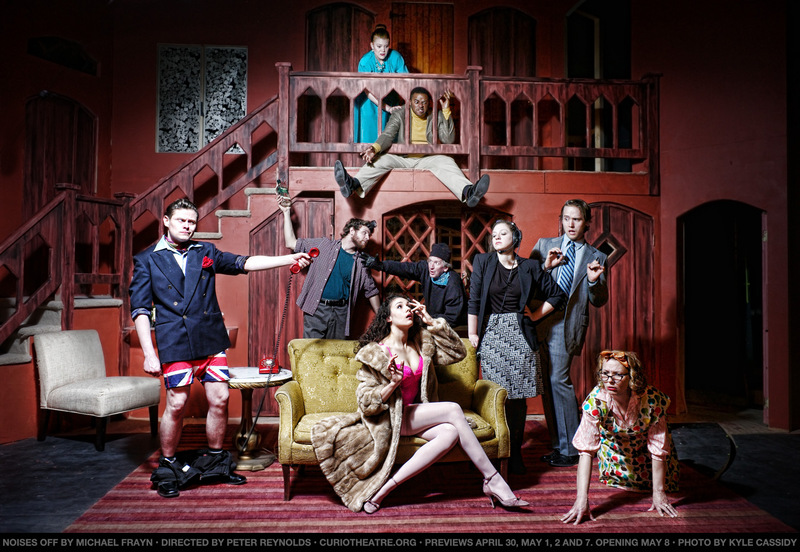 Noises off opens May 8th in Philadelphia. It was the middle of the night & everybody was TIRED & shiznit. Plus we were fast. i think we did the whole thing in 20 minutes. We're going to do another shoot after previews. I'll let you know. I've been on Curio's mailing list ever since we bought a copy of your Twelfth Night program book. So I glanced at my email the other day and saw "Theatre ... NOISES OFF" and thought, "OOO, I get to go see Noises Off!" Well, not unless I travel. But the cast photo, which is really deliciously deranged, enables me to imagine what the production must be like. :) I was just thinking about you guys yesterday. Hope everything is wonderful. Aww, that's nice to know. Things, hmm. Artistically wonderful, financially dire. The former should be used to correct the latter, but that is sometimes trickier than it should be.